The artist wonn the contest on decorationg the staircase and will start the work in March. Vernissage in Vännäsgången at 12.00-16.00. Welcome! Montessorihusets kindergarten will soon be finnished. Lois and friends and the gates for Montessorihuset in Nacka is finally reaching home! 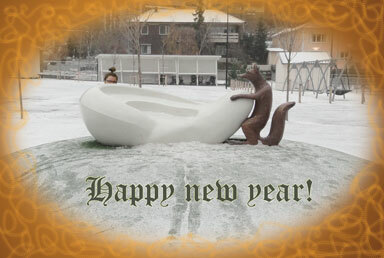 Invitation to inauguration will be placed on this site. Schoolyard at Skolsta, Enköping, is finnished! Hugin and Höfni is now in place. Inauguration will be announced later during atumn. Rakuträdet, exhibition at Edsvik arthall. Working on a scoolyard for Enköpings kommune. Skolsta scoolyard will recive Odins raven Hugin and Freyas cat Höfni in the autumn. For the 10th year in a row Roygalan is celebrated, this time at the China Theater in Stockholm. And for the third year the Prize stauette is delivered by the artist and (2012) handed over to the winner Jesper Kouthoofd Inc by Roy Andersson himself. 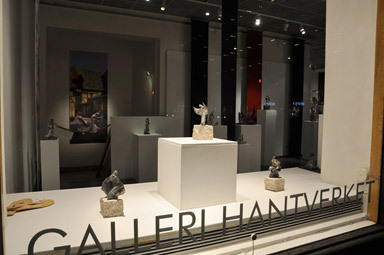 Separate exhibition "Clay, life and lust - danceimaginations" at Galleri Hantverket, Götgatan 65, Stockholm. From 15 September until 4 October. The artist has, together with landscaping arcitect and other artists, developed a part of the the park into a more playfull place. Be very welcome to the inauguration! Händelseriket is still getting attention! More articles about the use of Händelseriket, Karolinska Huddinge at Hjälpmedelsinstitutets site. About the fox behind the ear at Ängskolans schoolyard. Participating: the artist along with other new members of The Swedish Artists Society (SKF, Svenska Konstnärernas Förening) during 2011. Inauguration 28 April 12.00-16.00. Welcome! Inauguration 15 February 18.00-20.00. Welcome! 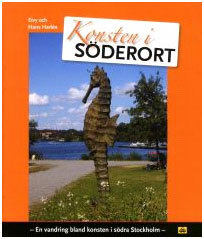 New book: Konsten i Söderort (Art in southern Stockholm). Eivy and Hans Harlén hav put together a nice compilation of the public art in southern parts and suburbs of Stockholm. The artist is represented by the Mosaicapples in Stureby. In Family Unity – Unity of the World. Opening day of the international exhibition. MGIMO, Moscow. Artist participates with "The first memory of my father", concrete sculpture/ photoprint on acrylic glass. Roygalan at Rival in Stockholm. Together with Roy Anderson the artist last year skulpted the Prize for the Roygala. This year 20 more Roystauettes were delivered for the event, and the artist will participate during the galaevening. Källängens totem Lois with friends has been completed for some time. The work will not be installed untill 2013 during delay in the builders entreprenad process. 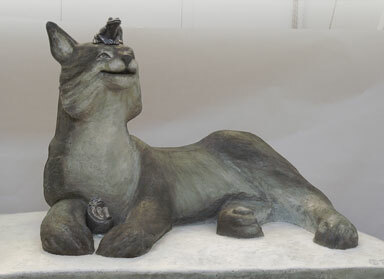 Lois will be waiting in the atelier, and it is possible to lend the sculpture for exhibitoions and events. Vernissage summerexhibition at Marsvinsholms sculpturepark. The beautiful castle and its park are situated close to Ystad in the south of Sweden. The artist will be present at the opening and her artwork will be for sale >> in the park and gallery all summer. 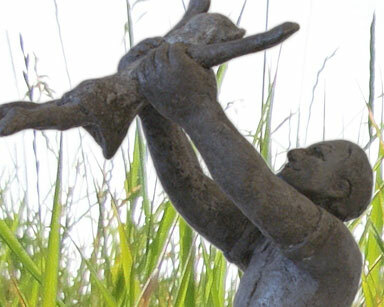 The artist will participate in the summerexhibition at Marsvinsholms sculpturepark 2011. The artist is working on project Källängen kindergarten. Foundation is casted in concrete and the Lynx is beginning to take shape. Stockholm City Cultural Departement has decided to cut down KKVs granted support into half. What will happen now? KKV - Live or die? Stockholm City Cultural Departement is about to decide cutting down KKVs granted suppurt into half. The artist is among other interviewed on the news. Protests and demonstrations outside City Townhall. Starting up project Källängen kindergarten. Contact artist to see work in progress. Working with Roy Anderson, sculpting the prize for Roygalan. Roygalan takes place 20/10 in Stockholm. Working on a portrait for bronze. Inauguration: Ängskolan art, schoolhouse and schoolyard. Official inauguration take place at schoolstart 9.00. The artist will be present at the spot 9.00 am and 17.00 pm. Address: Vackra Vägen 6-8, Sundbyberg. Skanska artsociety byes the concrete sculpture "Winged man". Open workshop at KKV, Nacka. Come and see artwork in progress, have a cup of coffe in the café or by a pice of art directly from one of the artists. "Konst i Roslagen" - open ateliérs. See Konst i Roslagen >> for more information. Ängskolan - starting up the production fase. After months of preparations the creation begins! Invited artist in the project of (re)making a schoolyard at Ängskolan, Sunbyberg. Working with landscape arcitects from Taggen (among other project members). Making sketches and drafts, aiming to incorporate the art naturally in the entirety of the schoolyard. Orderer: Sundbyberg Stad. Participated in the Mongolian sculptor G.Logiiraz workshop at University College of Arts Crafts and Design. Exhibition: Participates ART DAYS in Saltsjöbaden centrum Open Thursday & Friday 10-19, Saturday 10-15. Welcome! Invitation to all artlovers and artbuyers. Projektet avslutat. Invigning under våren 2007, datum meddelas senare. Vernissage "ONE EACH - STOCKHOLM"
and a child in the park of Karolinska University Childrens Hospital in Huddinge. In this connection, a presentation of the project was exhibited. Group-exhibition at AQS Art Gallery in Tumba. Exhibition continues untill 12th of May. at Infracity in Upplands Väsby, Stockholm. Object exhibited: Dragon in love.